The environment where the activity takes place. Is it too loud, is the area cluttered? Aim for a calm setting. Does the person prefer to do things alone or with just 1 person? Or do they like social events with more people? Most patients with dementia will not initiate activities and may not want to do things when asked. But the approach the caregiver uses to offer an activity and how the person is supported during the activity, can make a difference. 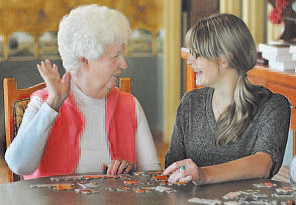 The caregiver may ask the person indirectly to participate. For example, instead of, "Do you want to play a game?" try "I have something that I need your help with." This approach can be less threatening to the person with dementia. Set-up: The person can complete the activity after the required supplies are set-up. The soap and dishrag are place next to the sink of dirty dishes. Prompting: The person requires verbal and/or physical prompts. A missed stain is pointed out or "what next?" is asked when the dishes are washed but not dried. Direct verbal cues: The person requires cues delivered one or two steps at a time. "Put the soap in the water. Rub the plate with the washcloth", etc. Physical assistance: The person requires your hand over theirs to direct the action. Your hand over their hand, guides the motion of washing the dish.